When I was writing my book David and Goliath, I went to see a woman in Winnipeg by the name of Wilma Derksen. Thirty years before, her teenage daughter, Candace, had disappeared on her way home from school. The city had launched the largest manhunt in its history, and after a week, Candace’s body was found in a hut a quarter of a mile from the Derksen’s house. Her hands and feet had been bound. Wilma and her husband Cliff were called in to the local police station and told the news. Candace’s funeral was the next day, followed by a news conference. Virtually every news outlet in the province was there because Candace’s disappearance had gripped the city. “How do you feel about whoever did this to Candace?” a reporter asked the Derksens. “We would like to know who the person or persons are so we could share, hopefully, a love that seems to be missing in these people’s lives,” Cliff said. I wanted to know where the Derksens found the strength to say those things. A sexual predator had kidnapped and murdered their daughter, and Cliff Derksen could talk about sharing his love with the killer and Wilma could stand up and say, “We have all done something dreadful in our lives, or have felt the urge to.” Where do two people find the power to forgive in a moment like that? That seemed like a relevant question to ask in a book called David and Goliath. 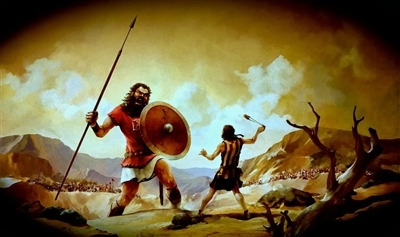 The moral of the Biblical account of the duel between David and Goliath, after all, is that our preconceptions about where power and strength reside are false. Goliath seemed formidable. But there are all kinds of hints in the biblical text that he was, in fact, not everything he seemed. Why did he need to be escorted to the valley floor by an attendant? Why did it take him so long to clue into the fact that David was clearly not intending to fight him with swords? There is even speculation among medical experts that Goliath may have been suffering from a condition called acromegaly—a disease that causes abnormal growth but also often has the side effect of restricted sight. What if Goliath had to be led to the valley floor and took so long to respond to David because he could only see a few feet in front of him? What if the very thing that made him appear so large and formidable, in other words, was also the cause of his greatest vulnerability? For the first year of my research, I collected examples of these kinds of paradoxes—where our intuitions about what an advantage or a disadvantage are turn out to be upside down. Why are so many successful entrepreneurs dyslexic? Why did so many American presidents and British prime ministers lose a parent in childhood? Is it possible that some of the things we hold dear in education—like small classes and prestigious schools—can do as much harm as good? I read studies and talked to social scientists and buried myself in the library and thought I knew the kind of book I wanted to write. Then I met Wilma Derksen. Click here to read the entire story by Malcolm Gladwell, courtesy of Relevant Magazine www.relevantmagazine.com. The views are those of the author and do not necessarily reflect the position or policy of the Florida Conference.